Keep your trees looking tidy with the Ryobi ONE+ Lithium-Ion Pole Saw. This cordless pole saw operates at 6.5 ft. or 9.5 ft. with the extension pole and features an 8 in. bar and chain for trimming away branches up to 6 in. dia. With an in-line motor and angled cutting head, you can remove branches easily, even in tight spaces. This saw features automatic bar and chain oiling for extra convenience and a clear-view fluid window to help you monitor oil levels. The 18-Volt compact Lithium-ion battery and charger are included and the battery completely recharges in just 30 min. Lithium-ion technology also provides fade free power to keep the battery running strong from beginning to end of the charge and the battery powers all of the tools in the Ryobi 18-Volt ONE+ family; that's more than 50 tools. All backed by a 3-year warranty, you can be sure the Ryobi 18-Volt Lithium-ion Pole Saw is ready for the task. Tbook.com crawls the web to find the best prices and availability on Tree Pruners and related Tools and Hardware products like Ryobi ONE+ 8 inch 18-Volt Lithium-Ion Cordless Pole Saw - 1.3 Ah Battery and Charger Included. For this page, related items include products we find that match the following keywords: "Tree Pruner" at our vendor partner Home Depot. 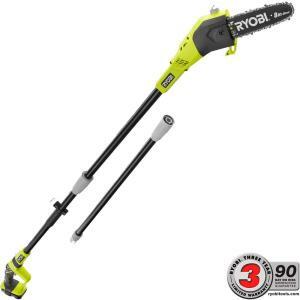 Ryobi ONE+ 8 inch 18-Volt Lithium-Ion Cordless Pole Saw - 1.3 Ah Battery and Charger Included is one of 75 Tree Pruners and related products listed in the Tools and Hardware section of Tbook.com If you have any questions on this product, please give us a call at 734-971-1210 during the hours of 9am - 5pm EST for assistance. Thank you for shopping at Tbook.com, the Internet Department Store!